Do you have a pine tree in your yard or vicinity? 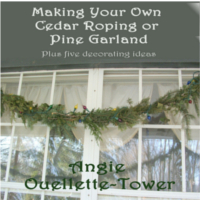 If you do then you can make your own Fresh Christmas Garland in Five Easy Steps. Fill your house with the Old World Charm and aroma of pine and cedar from Chrismas past. No more plastic knockoffs from the Megastore.